Get a mortgage pre-approval – Compare different lenders and secure a mortgage pre-approval. This will give you an idea of how much you have to spend on a house and will help position you as a serious buyer with sellers. Determine your budget – The amount you secure for your mortgage pre-approval is not always what you can afford. Keep in mind that you will also have to pay more for utilities, homeowner’s insurance, HOA fees, property tax, closing fees and more. Identify your wants and needs – Come up with a list of wants and needs so that you know what you’re looking for and so that you can more effectively compare the houses that you view. This is especially important if you’re buying a house with someone, such as your significant other. Identify future needs – Don’t just think about the present. For example, if you plan on raising a family, you may need an extra room. You’ll also want to make sure the neighborhood is safe and that the nearby schools are of high quality. Hire a real estate agent – A real estate agent can help find houses that fit your wants and needs and provide professional home buying advice. 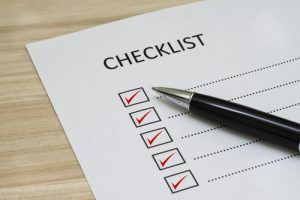 Using this home buying checklist should help first-time homebuyers get a grasp of what they need to do in order to successfully find and buy a new home. For more home buying advice, be sure to contact us at Randy Lindsay today.